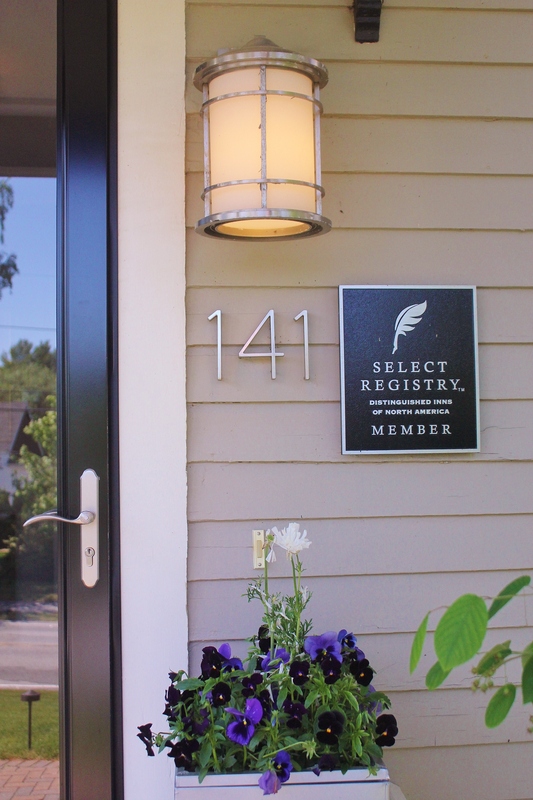 We kicked off our Inns Along the Coast tour in Kennebunkport, known as an ultimate waterfront destination in Maine. We were excited to visit this coastal water front town having never been there before. From Dock Square to the Kennebunk River to it’s five beaches, shops, galleries and restaurants this town offers many things to see and do. Historically, known as a shipbuilding and fishing village for well over a century the town is also a popular summer colony and seaside tourist destination. 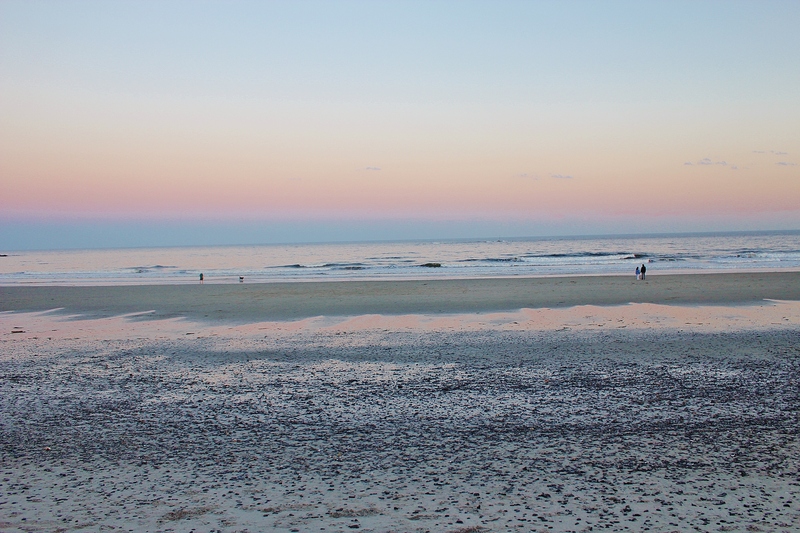 In Maine, the Kennebunks are bordered by some of the most beautiful and accessible beaches on the Atlantic Seaboard. 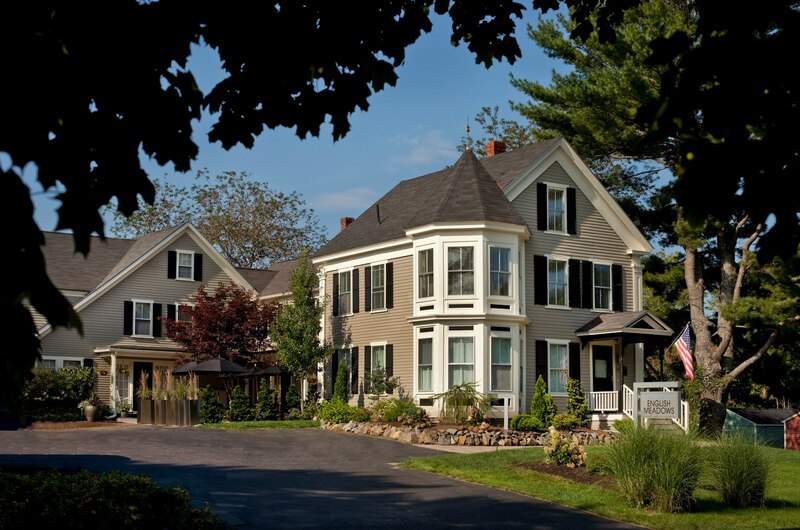 The Inn at English Meadow in Kennebunk is a newly renovated mid 1800’s Greek Revival Home and is a perfect Maine Getaway. 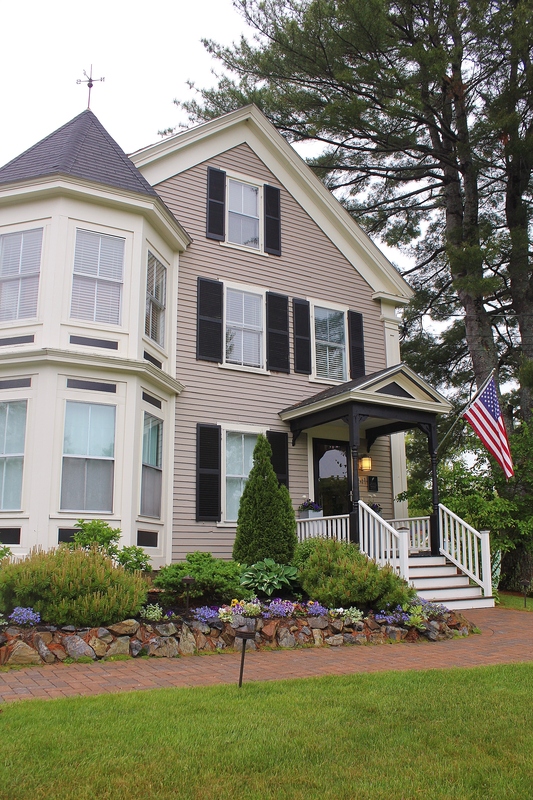 Innkeeper’s David and Kate Parisi offer luxurious lodging which is just an 8-minute walk to Dock Square shopping and restaurants, and two miles away from Kennebunkport Beach. 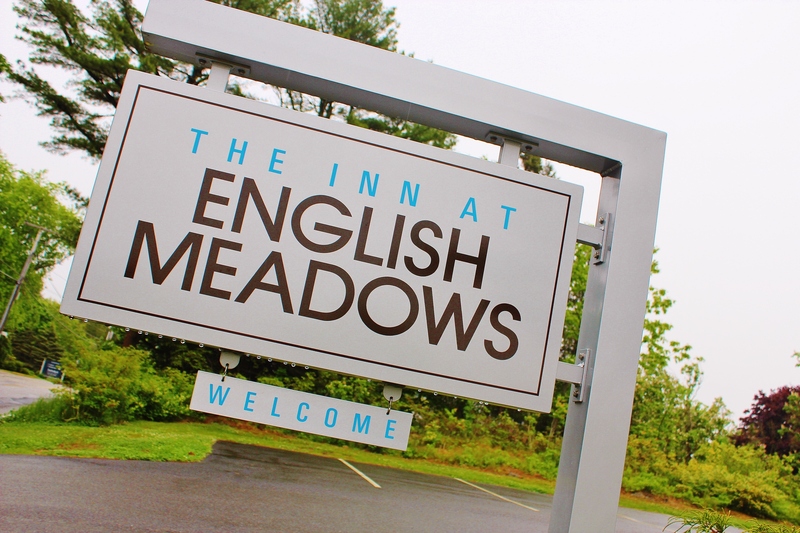 From the second you pull in the driveway and walk the Inns entrance, you know you are in for a welcoming warm stay. 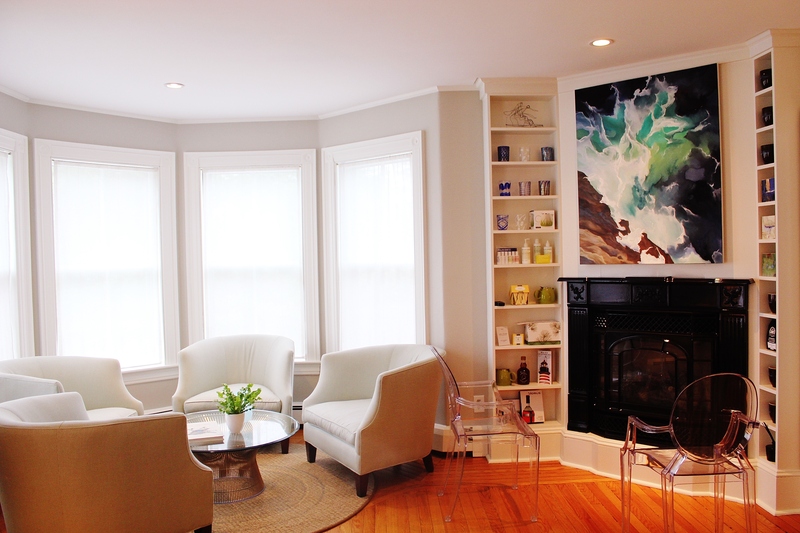 David and Kate call it a “SOHO meets the Kennebunks” vision. The B&B offers a unique combination of modern furniture and fixtures paired with impeccable maintained original moldings and wide plank floors. Two dramatically decorated common rooms filled with art from the owner’s personal collection will delight your senses. 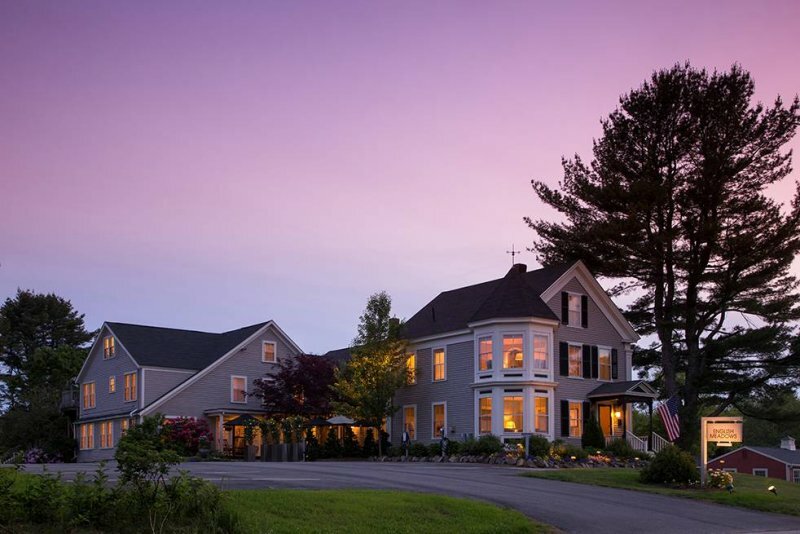 The Inn features five rooms, five suites and a bungalow. Each room is decorated with a palette that is relaxing and comfortable and cozy. 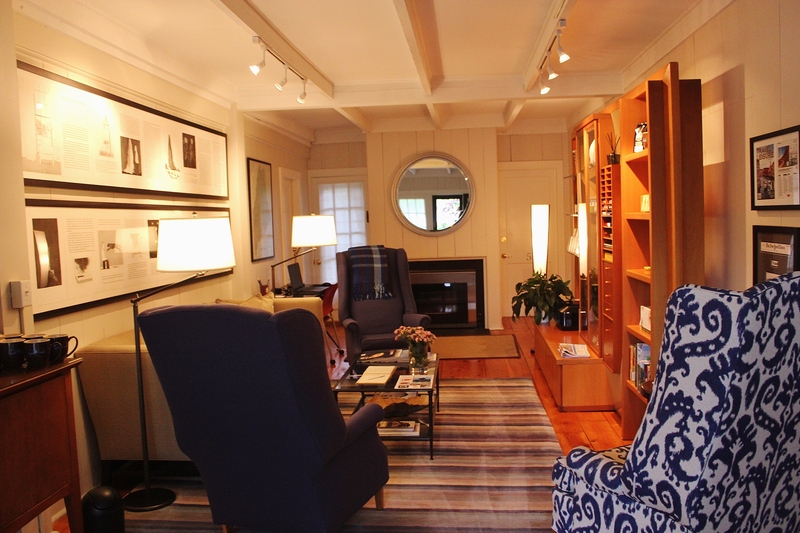 This is a historic farm house that was renovated into a wonderful modern style Inn. The former Greek Revival home was first built by local farmer Asa English circa 1860. The Englishes began a dairy business after the Civil War, keeping the cattle in the attached barn and renting rooms in the main house. Later, the barn became a carriage house, which was divided into seven rooms. The hayloft inside the old barn was converted into a large suite which is now called the Carriage House Suite. In addition, a small private cottage was added in the rear meadow, which is now referred to as the Bungalow. We loved touring the Inn as well as our stay in the Sunrise Room. Elegant amenities at this MUST VISIT Inn include Frette fine linens, bath robes, slippers and towels, toiletries by Malin + Getz and beds by Vera Wang. We had such a delightful nights rest staying at this Inn. Other special touches are WiFi Internet, docking stations, flat-screen TV’s, Nespresso machines and fireplaces. 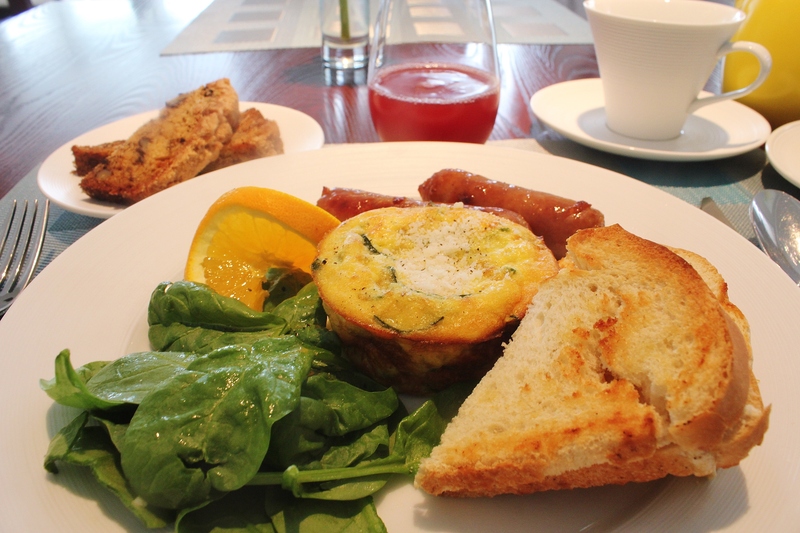 Another highlight of your stay is innkeeper Kate’s three-course gourmet breakfast and homemade baked goods that are served each morning and afternoon. 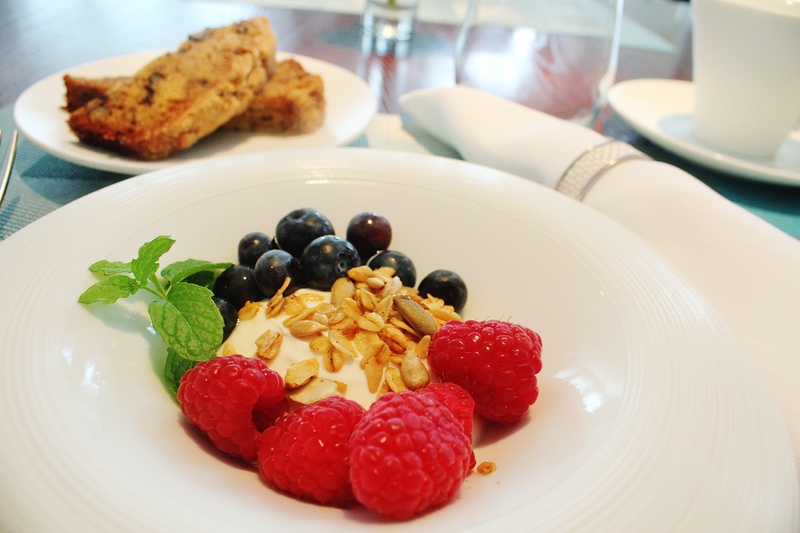 Everything from the breakfast yogurt parfait to the fresh baked breads had delicious bites of honey and cinnamon that just exploded in your mouth. The quiche was equally as hearty and delicious. The apple cranberry juice served from a local Kennebunkport company was very refreshing. A delightful patio and landscaped English garden are a great place to have breakfast or enjoy a bottle of wine and your favorite cocktails. This can be an almost inclusive stay if you like with a trip to the beach and Dock Square for dinner. 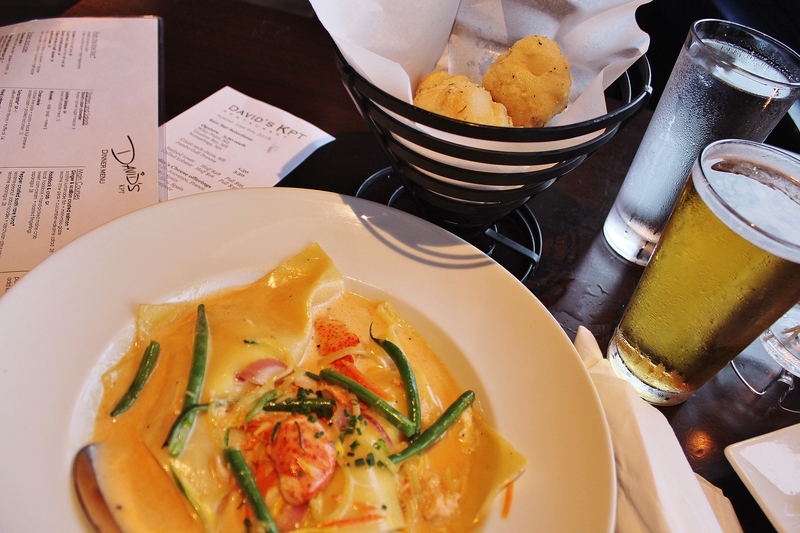 Speaking of dinner, I enjoyed the MOST delicious Lobster Ravioli with scallops and shrimp at David’s KPT. 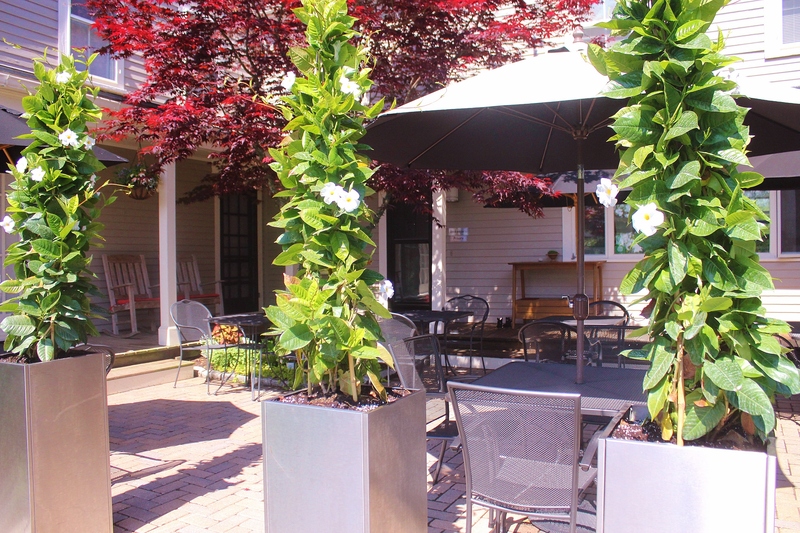 Acclaimed Portland chef, David Turin opened David’s KPT Spring 2013. 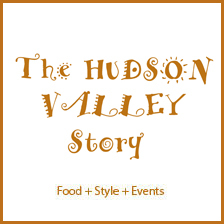 The restaurant offers creative contemporary cuisine and has outdoor dining and a deck with one of the BEST waterfront views in town. 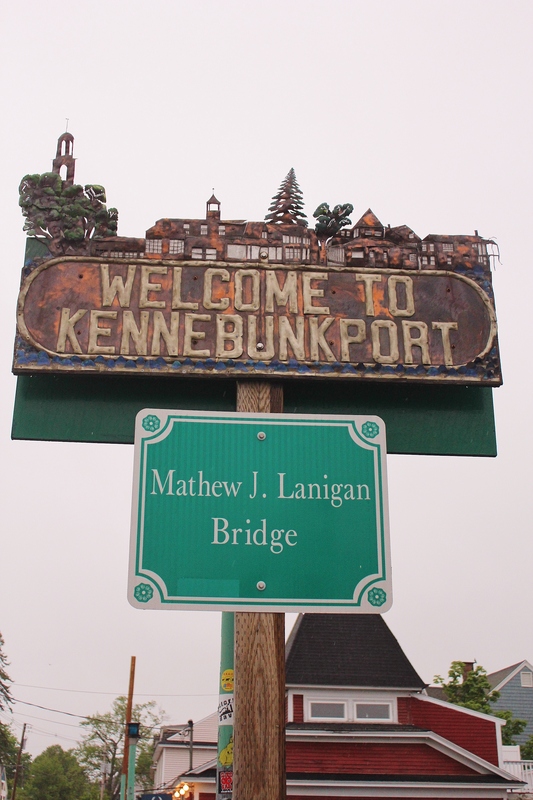 There are two vibrant bars and Kennebunkports only Raw Bar. I will be craving this meal again…and envision another trip to Kennebunkport just to enjoy this dish and stay at The Inn at English Meadow again! All of this is just a short walk or drive to the beach. You can also enjoy a short drive up to Cape Porpoise or the ocean views of the Bush compound at Walker’s Island. Shops in town like Dock Square Emporium offer unique items that we haven’t seen elsewhere. For Arranging a spectacular visit.